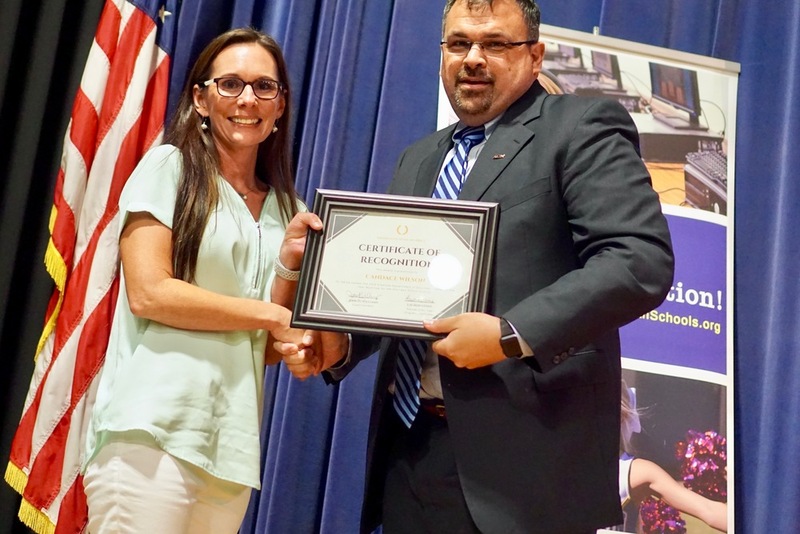 Sheridan Junior High School Science Teacher Candace Wilson is one of 14 outstanding teachers in Arkansas who have been named a Regional Finalist in the 2019 Arkansas Teacher of the Year program. "Ms. Wilson is dedicated, determined and passionate about making a difference in students’ lives," said Superintendent Jerrod Williams. "Her leadership skills, knowledge of student learning pathways, and expertise in science education make her a keystone for the faculty at SJHS. I am pleased to see her recognized for her dedication." With 13 years of service in education, Wilson is a leader among her peers. She serves as a member of her campus leadership team attending the Arkansas Leadership Academy Team Institute for the past two years. This school year, Wilson will teach two new courses in pre-engineering and technology at SJHS. According to her principal Alisa Gray, accepting new challenges and responsibilities is what has enabled her to grow year after year. "She is never stagnant," said Gray. "She seeks new learning to better herself and push her students’ academic achievement. She is not just a science teacher, she is an educator addressing the needs of the whole child to ensure that her students move forward." Gov. Asa Hutchinson and Arkansas Department of Education Commissioner Johnny Key will recognize the regional finalists August 16, 2018, at the Governor’s Mansion. Guests will arrive at 9:45 a.m., followed by networking and a reception. The program will begin at 11 a.m. During the ceremony, the four state semi-finalists will be announced.